Thrash metal from Coimbra, Portugal, Terror Empire formed in 2009. Influences – 80’s and 90’s thrash and old school death metal. Consistent performance, at home and abroad, since their debut EP, ‘Face The Terror’ was launched in 2012, has stood them in good stead to build a solid reputation amongst the metal community. ‘The Empire Strikes Black’, released in 2015, via Nordavind Records, earned global acclaim. Their constant club and fest gigs, alongside numerous high profile bands have enabled them to develop the memorable signature sound for which they’ve become known. 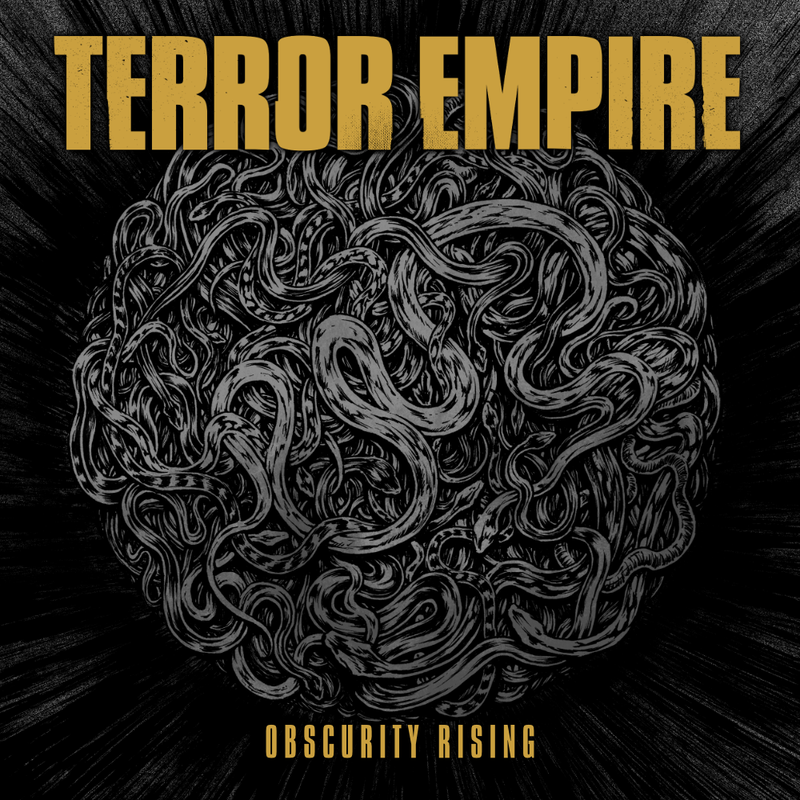 Turning up the heat on their ubiquitous political content, ‘Obscurity Rising’ combines thrash hooks and death metal vocals and rhythms, lasting nearly 40 minutes. Produced, recorded, mixed and mastered by drummer Joao Dourado, in his Golden Jack Studios, in Coimbra. The finished album characterises the sound of modern metal. Obscurity Rising – Clever rumbling intro. Very fitting, given the title. Great powerful blend of maximum volume riffs and drums, in a decimating rhythm. Over way too fast. You’ll Never See Us Coming – Launching straight into life, with a killing pace, blistering instrumentals and mind-crushing vocals. Rhythm increasing continuously, throwing in plenty of ace, trad metal, face melting riffs and finishing on a seriously crushing note. Heavy stuff. Burn The Flags – Drumming epic introing, laying down a tone of indisputably skull-wrecking proportions. Here we have an almost traumatically heavy track, with deathy growly vocals, incessant speed and aggression so severe, it’s edging on scary! You won’t hear the likes of this often. Hard impact. Times Of War – Propulsive, shocking and raw is where this is at. Bearing striking similarities to Exodus’s ‘War Is My Shepherd’, it’s about as hard and as heavy as it gets. A fierce concoction of stuff, for certain. No rest for the wicked here. Meaning In Darkness – Evening it out a bit now, with a thoughtfully gradual guitar solo intro, growing into another all-out intense metal attack, though just unfairly short, which is cruel. Holy Greed – Blasting into your skull, with another bangingly vicious track. D.R.I. style, with a ‘Beneath The Wheel’ sound-alike, only much heavier. Cutting edges, falling and splintering into shards of sharpened glass. That just about summarises this track. Some well integrated classic riffage accompanies a sense of physical rising – echoing the album title well. Lust – Bang! Nowhere else to go with this. Racing pace, loads of fantastically placed directional changes in rhythm, speeding on through the fray, like the embodiment of a speed freak. Combining old school, with modern twists, it’s the essence of a great metal song. Death Wish – Voice-over addiction related intro, rapidly followed by intense, ragingly angry thrash. Vocally adept and passion strewn lyrics drench it with feeling, encasing their message succinctly. A violent performance, all round. Feast Of The Wretched – Intelligently placed intro, conveying curiosity inducing mystique. Melting right into a mysterious metallic output – just a notch less volume, with an intriguing edge to the sound, implying possible eastern connections, but certainly no less power. Closing on the finality of a heavy-metal doorway closing and clanging shut, you’ll still be beset by the pneumatic drill, boring into your brain tissue. Again, it’s loudly affecting. Soldiers Of Nothing – One more curious intro, yet briefer, much briefer, this time. Moving over, immediately, for the brain-blasting steel fury that so characterises this entire album. Chucking in a relentless, remorseless round of attacking rhythm, it’s that machine-gun fire like sound that dominates the track, firing into your brain, to stay. New Dictators – No remorse and it’s Metallica’s ‘No Remorse’ that springs to mind, in the sound echoes here. Only, with a whole battalion of soldiers on horseback added to it, in the midst of battle. An epic slaughter of all that isn’t metal. A ceaseless, lethal round of exquisitely targeted live ammunition, from start to finish. Demolition be thy name. For fans of Exodus, Metallica, Megadeth, Anthrax, Slayer, Testament, Warpath, Grand Magus, Viking metal and death metal. Formed in Buffalo, New York, in 2010, Cain are a 3 piece thrash metal band. Influences: Rush, Slayer, Death, Atheist, Voivod, Terror Squad (Japan), Grave, etc. Cain’s sound is new, yet familiar. They’ve played live with Suffocation, Nunslaughter, Malevolent Creation, Hellwitch, D.R.I., Deathhammer, Hellbringer, etc. So far, they’ve done 3 tours of the U.S. and 1 of Canada. 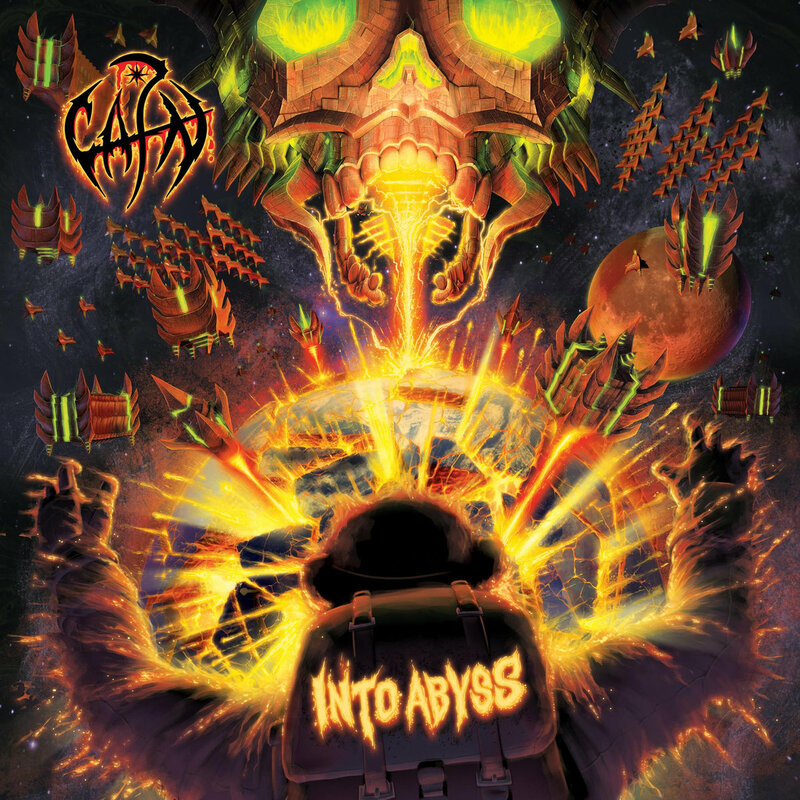 ‘Into Abyss’ is their 2nd album, released on CD and digitally, following their debut, ‘The Ravaging’, (2015, also released on both those formats and on vinyl). Additionally, they did a demo, in 2011 and a vinyl split with Maximum Oversatan. Necronomicon – Pure thrash heavy cathartic release intro. Absolutely smooth, seamless and sinister, yet compelling. Moving instantly, from considered chords, into outright fierce death-edged thrash. Short, but compact. Evilution – Drums opening, into a gloriously chaotic thrash rhythm, with an old school vibe, shining through the modern twist of aggressive, death-tinged metal. Some gorgeous riff melodies in there, complemented by the sharp, blackened vocals. Frantic pace, lots of gore, with a persistently catchy chorus. Cohesively frenetic and lively as hell. The Necromancer – Is it me, or are those vocals gaining in strength? Either way, there’s an audibly clear-sighted determination embedded within this sound and though it’s noticeably growly, the melodic riffs are strategically placed, so as to keep the catchy rhythm going. They succeed, as does the infinitely skilled precision of the all-out drum attack. All round, it’s very much a ‘wake up, world’ track and it works. Yokai! – Guitar break down introing, intriguing lyrics, more melodically focused and generally, a brief, but intense and concentrated track, with plenty of drive and no shortage of passion. Cyber Humans – That’s 1 tasty riff intro. Centring around the rhythm, this time, their enthusiasm’s blatant. Bringing in a new Bongo-like aspect to the drumming, revving up the rage and the rawness in the angry vocals, throwing in some well-placed speed elements, various rhythms and building momentum, till the end, it’s a highly intense and conscientious track. In Hell – Very Viking-esque energy to this one. Visually evocative atmosphere, giving it 100%, the forceful terror embodies the title. Flooding it with vivid imagery, the end result is as dark as the blackest night. Into Abyss – Drums taking the reins, at the outset, infusing the track with a deep physicality, matched by the other elements. A sinister, though curious overtone saturates the performance, bringing the diligence and experimental accomplishment to the fore. Unafraid to play around with sound and throw in a variety of possibilities, it’s a truly versatile, boundary pushing title track, intelligently crafted and thoughtfully ordered. Overall – An intricately worked, multi-skilled album, in which the spirit of thrash pervades. Blending elements of thrash, with death and Viking metal, there’s much to be discovered within the evident labour and perseverance that’s gone into ‘I.A’. It’s an album which’ll take you down many different avenues, exploring the depths and possibilities inherent within thrash metal and each one will reveal a new twist. For fans of In My Embrace, Slayer, Testament, Carcass, Iron Monkey, thrash, death and Viking metal, generally. Available on CD and digitally. Alternative rock/metal band KLOGR have now launched their new video for their latest single, ‘Sleeping Through The Seasons’. Along with the rest of the album ‘Keystone’, the track was recorded at Zeta Factory Studio and mixed at Mainstation Studio, Toronto, Canada, by David Bottrill, Grammy-winning producer, known for his past work with Dream Theater, Stone Sour, Tool, Rush etc. ‘STTS’ was influenced by the book and film ‘Lord Of The Flies’, based on the concept of a group of boys trapped on an isolated island and the catastrophic results of their self-government. Artist for ‘Keystone’, Andrea Saltini created the storyboard for the ‘STTS’ video, together with art director Chiara Silvestri. Shoot organisation was by Roberto Zampa, who directed the bands’ previous videos, ‘King Of Unknown’, ‘Breaking Down’ and ‘Breathing Heart’. It was edited and directed by Matteo Pasquali, previous director of ‘Bleeding’ and ‘Draw Closer’. Front man Rusty feels that the use of the ‘Lord Of The Flies’ inspiration brought a broad perspective to the album, consolidating it into the video. He’s personally inspired by networking with fellow creatives, whose opinions he values, pertaining to his work with KLOGR. The ‘Keystone’ album, on which ‘STTS’ features is released on October 6th, by Zeta Factory/PHD. This single follows the ‘Keystone’ album’s lead track, ‘Prison Of Light’. KLOGR will perform as special guests to Rasmus on their ‘Dark Matters’ tour of Europe, this November. Right in there, wasting no time, with an instantly catchy punchy hard rock intro. Massively melodic, raw and upliftingly energetic. Visually and audibly, it’s got a range of emotions packed into it and the presentation, along with those lively vocals are an absolute winning combination. Moving, seamlessly, between black, white, grey and coloured backgrounds, matching the lyrical dexterity, vocal range and instrumental passion and edge, it’s a heavy, vibrant track, with immediate hit written all over it. Watch, buy, play. Now. For fans of melodic hard rock and heavy metal, with lots of groove. Music, blog and review related comments only on the blog please. Anything else will be deleted, as spam. Thank you. APF records have announced the launch of ‘Binge’, Bong Cauldron’s debut album, on 30th November 2017. The sludge meisters now have a big following in the underground metal scene, leading to support gigs with Corrosion Of Conformity, Eyehategod, Pentagram, Weedeater, Yob, Windhand and Monolord, etc. Recorded by Chris Fielding, of Conan, at his own Skyhammer Studio, ‘Binge’ will be available on limited edition green and black vinyl, limited edition digipack CDs and digitally. Renowned for their massive riffs and huge grooves, Bong Cauldron have sought to attain this sound on ‘Binge’. Devil – Fittingly evil feedback intro, before launching straight into classic sludge territory. Aptly satanic lyrics, set to what becomes a fairly catchy rhythm. Well conveyed vocal frustration and an effective outro, equalling the intro. A fair start. Bury Your Axe In The Crania Of Lesser Men – Good penetrating bass heavy intro, with very bloody vocals and lots of generic sludge. Pretty basic filler. Still effective, but just not much more to say about it. Needs a few diversity markers. 68 – Great powerful drum intro, throwing in much more power to the vocals and accompaniments, this time. A far more memorable, speed themed, aggressive track. Refocused catch and hooks – it’s a vast improvement. Binge – A bit yo-yo-ish, in intro sound terms. Big reverb emphasis and quite growly, vocally. More anger coming across now. Catchier melody injected into this one, which although simple, really becomes the main focus, forming a stronger base around which, the rest of the songs’ structure is formed. Building in power and momentum, for the acute finale, the title track’s redeemed the album, so far. Bigfoot Reigns – Faster riff intro takes control, evolving into a fairground revolution like intensity. Central to the song, it does it great justice. Drums and bass forming a new layer of sludge, strengthening the general intensity, it then moves on to another level of sensory experience, ending just in time to rescue itself from the risk of becoming lost in the chamber of its own sound. Hopeless – Clearer brief fingerpicking solo acoustic intro, then launching into newer ground. Taking on a new life, in the form of a more power focused composition, the sludge returns, towards the end. Powerful close, ‘Hopeless’ displays an oddly hopeful blend of uplifting speed, melody and grounding sludge. The strongest track so far. Toxic Boglin – Lots of heaviness here. Slight vibrato approaching edge to the riffage now, it’s a short track, yet holds a lot of power. Slightly clearer vocal emphasis, too. A track with not much to say, but which packs a lot into its brief message. Yorkshire Born – Upping the party rock fun factor, it’s a track approaching mosh pit territory. Filling the whole song with that kind of light-hearted vibe, it’s almost like a form of light relief respite, saved for last. Over fairly quickly, it brings a relaxed element, to the album’s end. Overall – A fairly average, but gradually improving sludge offering, gathering pace and enjoyment, as it progresses. Could do with more excitement, but picks up the power, 3 tracks in. Its strengths are in its speed, melodic and power elements, so playing to these a lot more would serve it well, even as a sludge album. Heard better, but also heard far worse. As standard sludge, it’ll do. Just best kept for low-energy days and indifferent frames of mind. For fans of Iron Monkey and other doom based sludge metal. Mastered by James Plotkin, at Plotkinworks. Artwork by Dominic Sohor, at Dominic Sohor Design. Released 1st December 2017, via APF Records. Welcome to sludge doom metal band Pale Horseman’s forthcoming release, ‘The Fourth Seal’. A self release, recorded, mixed and mastered at Comatose Studio, in Bradley, Illinois, USA, by Dennis Pleckham, of Bongripper. The band feel that since new drummer Jason Shryver joined the line-up, the overall sound, quality and production of their work has improved immeasurably. It’s this positive influence to which they attribute increased pride and confidence in their music, in particular, this release. Pale Horseman hail from Chicago, utilising twin guitar and vocals and a pounding drum section. With acclaimed live performances, their studio albums are produced by some of their own favoured influences, for instance, Dennis Pleckham, Noah Landis of Neurosis and Justin Broadrick of Godflesh. Final War – Instant impacting, attention grabbing, heavy riff intro. The sludge comes into play immediately, with obvious elements of death and doom metal, vocally audible. Whilst it’s not what you could call exciting, it’s not too downbeat to listen to either. Slightly samey, for most of the track, but there’s enough melodic and rhythmic alternation, to make it an okay listen. Witches Will Gather – Again, fairly riff focused, with a large sludge/doom aspect. TBF, nothing from this genre is likely to win prizes for upbeat sounds, but that’s not it’s aim. Having said that, there is definite catch in this track and its hooks, from the mid-section on, are undeniable. Slowing the pace down, increasingly, from there, it fades out on a reverb sound. Passable. Aokigahara – Classic doom/sludge intro, with some more deathy stuff included, it’s just more of a standard filler, than being inspiring in any way. However, there’s also variation in sound, style and technique, after the mid-point. It seems it’s a trend, with Pale Horseman, to incorporate the changes and diversity from the central point of tracks. Still, there’s not much change, after that. Slight ominous sense to the outro, but given it’s a sludge/doom album, that’s to be expected. Bereavement – Slowing and seemingly toning things down even further now. Interestingly, early Sabbath-esque. Deeply ominous now, exuding sinister force. Gaining in strength, there’s a wilful energy infecting this track here. Blatantly battle-esque and severe, in tone, till the merest chink of light manifests, in the slightest loosening of the instrumentals, through which, that minimally higher key is performed. By the closing section, you’re aware of the impressive aural portrayal of ‘bereavement’, itself. Gnashing Of Teeth – Alarmingly affecting, physically palpable intro. Enough in itself, to distract you, with its sudden, unexpected impact. Much like how you might imagine being slammed and sandwiched between two cars and then thrown from bumper-to-bumper incessantly. P.H. are certainly skilled at immortalising the sense of physicality, inherent within their track titles. Forlorn Extinction – Coming into the intro, in a manner so smooth, it better befits a mid-way point, like one long, continuous stream of consciousness. A noticeably more aggressive edge to the lyrics, creeping into the accompaniments, till it becomes the song’s general essence. Unusual choice of sentiment for this particular title, but well delivered. Pale Rider – Lots of slide in the opening riffs and not discounting that now ubiquitous darkness, embodying and enshrouding the vocals. A bit morose, but it is doom/sludge, after all. Just a concerted doom fest. An overshadowing sense of encroaching, impending doom, expected of a track so entitled. In that respect, it does its job well. Tyrant – Livening things up now, with a marked uplift in pitch and a breathier rhythm, it exudes a powerful angry force. Becoming angrier, in deference to the title, it’s just a forceful energy, overpowering, in its strength. Phantasmal Voice – Highly catchy drum rhythm intro, that’s the prime focus now, with the prideful, tribal vocals, primal in their delivery. Some snazzier, jazzier riffs and a more concentrated rhythm. Very classic heavy Dio-esque vocal section in there; fans of the Dio, Iommi, Sazzo version of ‘God Rest Ye Merry Gentlemen’ won’t forget this closing section). Clever way to end, on a sound resembling such a memorable version of such a well-known carol). Overall – On the whole, a passable background filler, but with enough experimental variation and clear emotional energy to make it memorable. So it’s never gonna win any prizes for its uplifting quality, but no one expects that in sludge/doom productions anyway. Not unless you happen to be Down. Or Electric Wizard. Or Kyuss. You get the gist. Anyway, a largely reasonable listen, with a few hints of intrigue thrown in. For fans of generic doom, sludge and early Sabbath.